1. 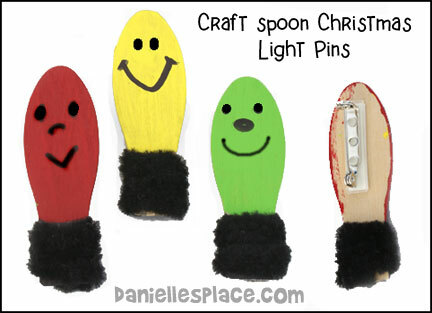 Cut 3/4" off the skinny end of a craft spoon with some heavy duty scissors leaving a Christmas light shape. 2. Paint the craft spoon and let it dry. Cut a black chenille stem in half and wind it around the small end of the cut spoon. Glue on googly eyes and draw in a mouth and nose. 3. Stick the sticky back pin to the back of the finished Christmas light. If you don't have the sticky back pins, you can just tape a safety pin to the back, or glue on a magnet and use it as a refrigerator magnet. 1. Draw Christmas light shapes onto red, green, and yellow card stock so that two lights are connected at the top. Cut the lights out . 2. Fold the light patterns in half over a pencil and glue the lights together back to back. The pencil will leave a space big enough to string a cord through the lights. 3. Cut the straws into one-inch sections, and the nylon cord into necklace lengths. 4. In class have your children string the lights and straw pieces onto the cord to make a necklace. 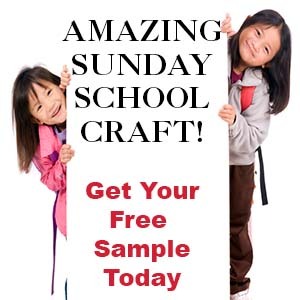 The following crafts go along with the Sunday School Lesson "Jesus Lights Up My Life" on The Resource Room. In this lesson children learn why Jesus described himself as the "Light of the World", how Jesus lights up our lives, and how we can be a light to others. 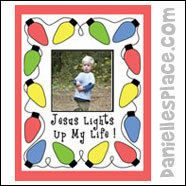 Children color the Christmas lights different colors and then glue the picture to a piece of construction paper. You can have them draw a picture in the center of the frame or you can take glue a picture of the child in the center. For more information about becoming a member go to the Membership Information Page. Place small amounts of paint on paper plates and have your children dip their fingers into the paint and press them on the paper near the black rectangle shapes to make the Christmas lights. You can glue a picture of the children in the center of the sheet or have your children draw a picture in the center. 1. Before class print out large Christmas light shapes onto colorful paper. Write one word of the Bible verse on each paper Christmas light. Make several sets. 2. Tape long lengths of ribbon on the wall. The paper lights will be taped to these ribbons during the game to make a string of lights. If you have very young children who cannot read, write the Bible verse in large letters on the board or poster board so they will be able to see the complete verse when they play the game. In class break your children up into teams. 3. Give each team a set of lights and some tape. On the word go the teams should try to tape all the lights in order on the ribbon to spell out the verse as fast as they can. The team that finishes first wins. If you have very young children, you can play an easier game. Hide all the paper Christmas lights in the room. Have your children look for them. When a child has found a light have him sit down. When all the children are sitting go over the verse, word for word. Have your children look to see if they have the word you are discussing. The child who has that word can come up and tape it to the ribbon. 1. 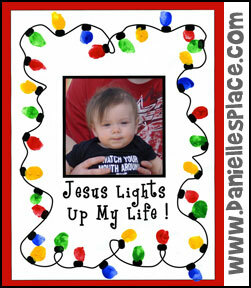 Print out enough large Christmas light patterns to write one word of the verse on each light. 3. Divide your children up into teams and tape one paper light on the chest of each child and on the word go have them get in order to spell out the verse holding hands to form a string of Christmas lights. The team that has all the words in order and is all holding hands first wins.